EK-FB MSI Z270/Z370 GAMING Monoblock RGB is a complete all-in-one (CPU and motherboard) liquid cooling solution for Intel® LGA-1151 socket Kaby Lake®, Sky Lake® CPU's and it is compatible with several MSI® Z270/Z370 motherboards. The monoblock is equipped with a 4-pin RGB LED strip and it offers unparallel aesthetics alongside with superior performance! The RGB LED in the monoblock is compatible with MSI® Mystic Light Sync, thus offering a full lighting customization experience! 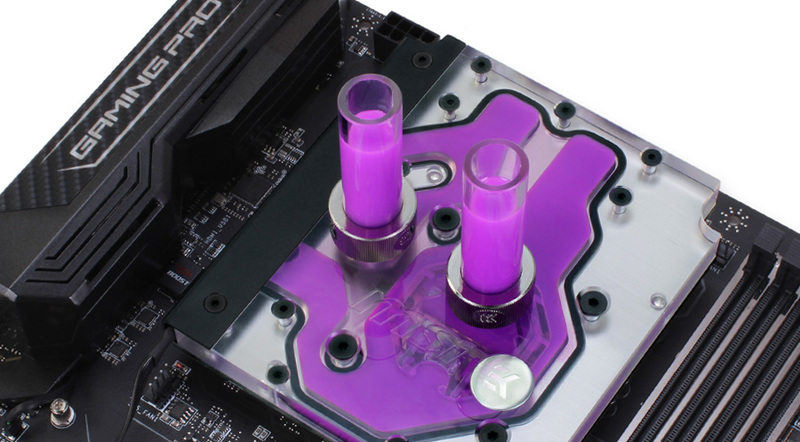 The stock mother board I/O cover is compatible with this EK monoblock. This EK monoblock will not interfere with the M.2 Connector.